"I'm in productivity hell. For the past week, I’ve been using Samsung’s Galaxy Tab S3 to read Twitter, correspond on Slack, and write articles for this website. The Tab S3 is capable of doing all these things — in some cases, it’s even capable of doing them quite well — but it’s not capable of doing them anywhere near as well as a proper laptop. And in the week I’ve had it, I’ve spent a lot of time wondering why I’d use this tablet as a portable work device instead of a cheaper, more functional computer like a Chromebook. The Tab S3 is a direct shot from Samsung at Apple’s latest iPad Pro. On description alone, the two match up beat for beat: they have 9.7-inch, high-resolution displays (both 2048 x 1536), nearly top-of-the-line processors, 32GB of internal storage, fingerprint sensors, four speakers, measure 0.24 inches deep at their thickest, weigh just shy of one pound, sell for $599, and support both a stylus and keyboard case. That means that, like the iPad Pro, the Tab S3 is pitched as more than just a tablet. It’s good for laying in bed and watching Netflix, of course, but it’s also supposed to be great for bringing to the coffee shop, propping up on a tray table, or firing off a quick email while you’re on the go. That’s a much more challenging task. 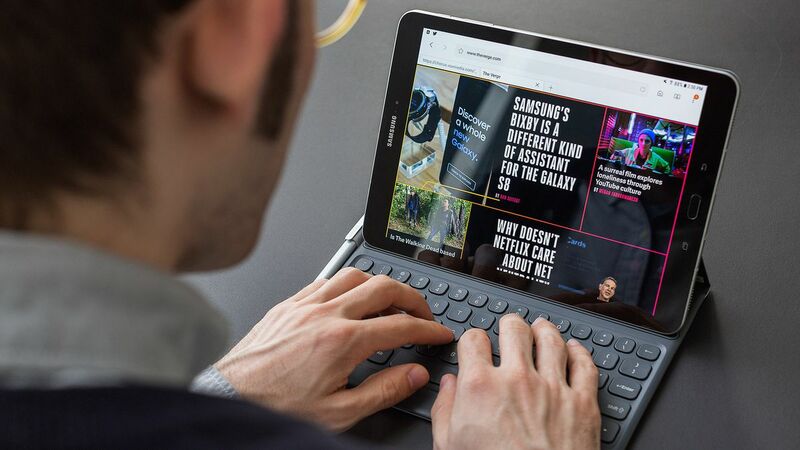 And it’s one that, combined with the full $730 asking price for this tablet and its keyboard case (sold separately), Samsung has a fairly challenging bar to meet."